In our tenth year: four Monday evenings of Architecture+Philosophy presentation and discussion in one of Melbourne's most welcoming ideas spaces. Whatever happened to the Queens of Pomo Söder? Back in early 2005, Architecture+Philosophy's very first speaker was Leon van Schaik on poetics in architecture, in conversation with Allan Powell, architect of the then newly opened TarraWarra Museum of Art. Reflecting on the past decade and the next, Leon and Esther will discuss the public spaces Leon has stewarded, his approach to leadership as an architect, and the architecture of public life at large. All welcome - no cost to attend - no need to RSVP. Leon van Schaik AO, B.Arch. Studies (Ncle), AADip (SADG), M.Arch (UCT), PhD (CNAA), RIBA, LFAIA, LFAA, is Professor of Architecture with an Innovation Chair in Design Practice Research at RMIT University. He has written books on spatial thinking, the poetics of architecture and the processes involved in procuring innovative architecture. The practice-based research PhD program that he initiated has become a template for institutions worldwide. 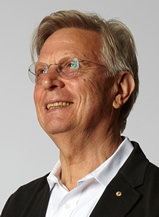 His support of local architectural cultures and his leadership in the procurement of exemplary architecture has resulted in some of Melbourne’s most distinguished contemporary buildings. What are the Swensk sessions? Since 2012, Architecture+Philosophy has had a Swensk connection, with one half of our curatorium based at Stockholm's KTH. In Melbourne, Swensk is a place and a project. Swensk believes that interesting people never go out of fashion. Their commitment to slow fashion for interesting people is both political and philosophical. It's the perfect gathering space. HELEN RUNTING is an urban planner and urban designer, who is based in both Stockholm and Melbourne. She is currently completing a PhD in Critical Studies in Architecture at the Royal Institute of Technology (KTH) in Stockholm. Situated within the field of architectural theory and criticism, her research explores the constitution of the postmodern, fictionalised and “synthetic” subjects of contemporary Scandinavian comprehensive urban planning and development. Helen is a member of the architectural office Svensk Standard and editor of the architectural research journal LO-RES. the Queens of PoMo Söder? At the commencement of the Spring term 2014, members from the Critical Studies Design Studio delivered an intensive (re)orientations workshop to over 100 Masters of Architecture students studying at KTH School of Architecture, Stockholm. The title of the workshop was Queens of PoMo Söder and the aim was to collaboratively map, analyse, celebrate and also suggest discrete alterations to the now aging Postmodern (PoMo) residential and mixed use development around Södra commuter train station, Södermalm, an inner city island of Stockholm. Since 2009, Critical Studies Design Studio (CDSD) has regularly offered an inclusive learning environment that emphasises feminist and queer design practices, the employment of critical theory drawn from philosophy, and participatory mapping approaches including skills asset mapping, which can be broadly identified as a form of architectural action research. The aspiration of our design studio has been toward assisting students of architecture (as well as ourselves as teachers) to understand how our position of relative expertise in architecture enables us to create societal impact at the scale of the local, and also how to situate ourselves in relation to larger geopolitical concerns. CSDS emerged out of a group of Stockholm-based researchers, teachers and architects that included Katarina Bonnevier, Brady Burroughs, Katja Grillner, Meike Schalk, Lena Villner. Their provocative name was FATALE (Feminist Architecture Theory: Analysis Laboratory Education), and they banded together in 2007 with the urgent desire to make a change possible within and beyond architectural culture and education, aiming to open up the boundaries of what is conventionally perceived to correctly ‘belong’ to architecture, and also to challenge who can be perceived to be an ‘architect’. It is into this affirmative environment that I have been so fortunate to situate my own teaching and research since relocating from the School of Architecture and Design, RMIT University Melbourne in late 2011. With this lecture I will offer an account of some of the explorative pedagogical approaches CSDS has ventured over the years, with an emphasis on our most recent intensive design research workshop, Queens of Söder. This will mean discussing: how to make yourself a feminist design power tool; how to acknowledge your situated knowledge; and how to explore ficto-critical approaches to design thinking via the invention of aesthetic personae. In recent years a resurgent feminism has emerged into the public sphere, particularly in the virtual public space of social media. From websites focused on issues of equity (Women’s Agenda), to sites for sharing individual experiences within a larger collective consciousness such as Laura Bates’ Everyday Sexism Project, a new activism has found new means to pursue aims of gender equity. This presentation will focus on the topic of gender equity and architecture. Women architects’ participation in the “formal” architectural economy in Australia is still low, at about 22% of male architects, despite women entering architecture schools at near equal numbers to men for almost twenty-five years. The “Parlour” project is a web-based forum emerging from an Australian Research Council funded project dedicated to investigating best practice for gender equity in the architecture profession. This presentation will explain the focus of the research and its findings and discuss some of the gender issues and campaigns that Parlour has highlighted as central to change. DR KAREN BURNS is a writer, feminist theorist, historian and a Senior Lecturer in the Faculty of Architecture, Building and Planning at the University of Melbourne. JUSTINE CLARK is an independent editor, writer, critic and researcher. She is the editor of Parlour: women, equity, architecture. Architecture+Philosophy is an independent public program co-curated by Esther Anatolitis and Dr Hélène Frichot since 2005. ARCHITECTURE+PHILOSOPHY creates a space of exchange between the two disciplines. We welcome participants from any discipline to engage with questions of contemporary urbanism, planning, technology, space, system, design, distribution and other issues in the productive overlap between the two disciplines. We curate a diverse range of presentations, public, site-specifc and online projects, from research students and established academics to architecture and planning practitioners, policy makers, public artists and those working in the world between theory, buildings and the city. In 2014, Architecture+Philosophy is presented in partnership with Swensk. Architecture+Philosophy has presented an inspiring diversity of thinkers, makers, collaborators and speakers across a decade.